If it had not been for Windows 7 I do not think I would ever have found the best answer to this problem. I own an iPhone and it is synchronised and managed via the Mac Mini on our network. The iPhoto Collection of images from the iPhone have been difficult to access from other Machines. iPhoto does not have the best track record for providing network shares to photo libraries. Discovering that Windows Live Mesh was available to for the Apple OS X platform meant that I had an answer to the problem of copying all the iPhone/ iPhoto images from one Mac any other Windows Live Mesh Client. Further it had the added advantage of providing multiple backups of all photographs. I set up Live mesh on the Windows and Mac clients. On the Mac I configured it to Sync the Folder from ‘Pictures iPhoto Library Masters’ and on the Windows 7 machines I created a new Folder above ‘My Pictures’ called ‘iPhoto’. I then selected that folder as the destination for the sync feed at each client. 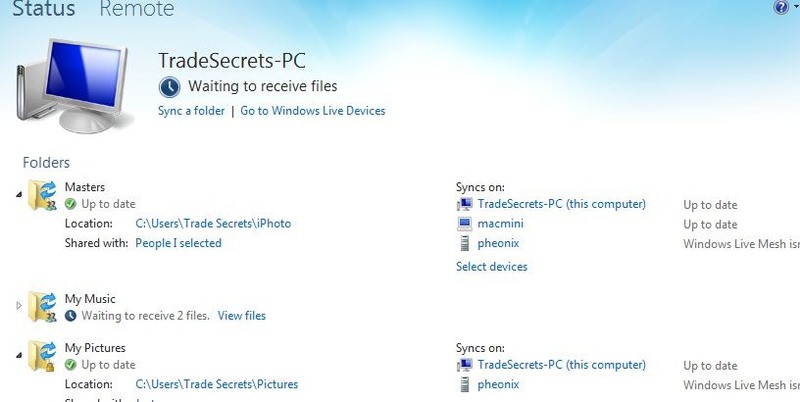 I chose a folder above the ‘My Pictures’ folder because I had configured a ‘My Pictures’ Sync Feed between all my Windows 7 Clients. I added the iPhoto folder to the Libraries for Photos in explorer and I was done. Now all the Windows Machines get a copy of my iPhoto library . 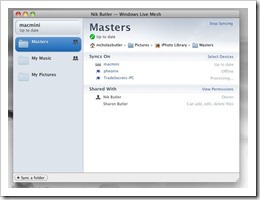 The Sync is one way as iPhoto does not care about Windows Live Photogallery changes. 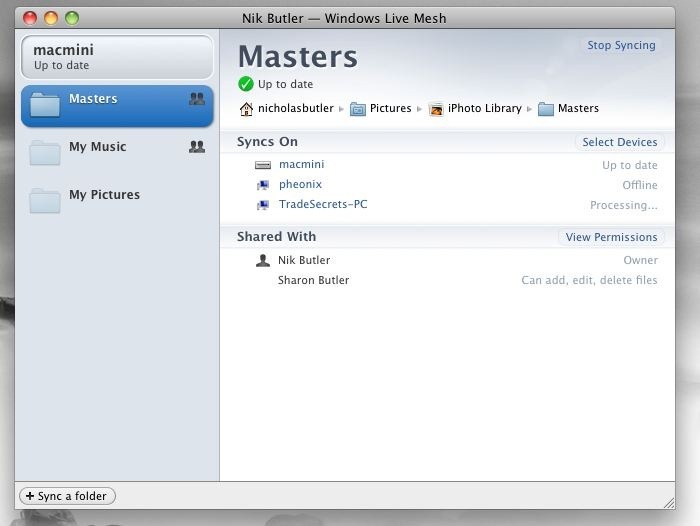 Oh and one more thing; Sharon has her own Windows Live Essentials Account I shared the iPhoto masters library with her account in addition to my own, making Windows Live Mesh an efficient way to share the Photos with other user accounts that you trust something Dropbox users are familiar with. Now with the luck of Google juice people looking for ways to duplicate and access their iPhoto collections with Windows machines will have an answer. ← Favstar an Underated Metric. Do you mind sharing what version of OSX and iPhoto you are using? In snow leopard and iphoto 09 I cannot go beyond the iPhoto library when looking for folders to sync in Live Mesh. From my reading, pics and movies stored in iPhoto cannot be accessed through the finder (and therefor not accessible through Live Mesh, https://discussions.apple.com/thread/1789780?start=0&tstart=0). If things have changed since Snow Leopard/iPhoto 09, it would be great to know.